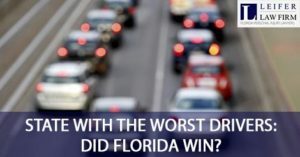 What State Has The Worst Drivers - Did Florida Win? Travel anywhere in the U.S. and you’re likely to hear a range of opinions when it comes to singling out the state with the worst drivers. However, one thing is pretty consistent from sea to shining sea: The worst drivers always seem to live in other states. You’re unlikely to hear drivers admit their own state takes top honors in the worst driving department. So, which states really do have the worst drivers? Is there a state that beats the other 49 when it comes to bad driving? It depends on where you look and whom you ask. As Florida auto accident lawyers, we are well aware that the Sunshine State sometimes gets lumped into the “worst drivers in the country” category. In some respects, this reputation is unfortunately deserved. When it comes to the worst driving overall, however, it really depends on what criteria you use to determine which states top the list – and the answer may surprise you. Trying to determine which states have the worst drivers is somewhat challenging, as different studies use different criteria for assessing risk. For example, some studies look at the number of speeding tickets, whereas other studies consider only fatal accidents. In a study conducted by Smart Asset, Florida was ranked as the worst state in the country for driving based almost exclusively on how often Floridians google “speeding tickets” and “traffic tickets.” Other states, such as New Jersey and Delaware, had more fatal accidents than other states, including Florida. Could it be that Florida drivers are just naturally curious about speeding tickets? Contrast this with a different study, which named Montana the worst state for driving. Montana was ranked first based on numerous factors, including its high speed limits (80 miles per hour in some places), intense winter weather, and disproportionately large number of traffic violations compared to population size. In the same study, Florida did not even crack the top 10. In fact, Florida ranked 32nd out of 50 states for the worst drivers. Top finishers included Texas, New Mexico, and Louisiana. It’s worth noting, however, that Florida did rank second in the U.S. for the number of uninsured drivers – just one reason it’s important to carry uninsured/under-insured motorist coverage in Florida. According to Car Insurance Comparison, which conducted the study, researchers used five factors to rank the worst states for driving. Researchers also limited their data to fatal crashes. Interestingly, nearly all of the states with the worst drivers had high rates of pedestrian and bicycle fatalities. The same group of states also topped the list for distracted drivers. Florida may not be the worst state for driving, but there is no denying it has some of the deadliest roads in the country. Studies consistently rank Interstate 95, Interstate 4, and Interstate 75 as three of the most dangerous highways in the United States, with Interstate 95 called the number one deadliest road in America. In a span of just four years, there were 662 fatal car crashes on I-95, which is one deadly crash every 1.73 miles. Florida also has the highest number of fatal bicycle accidents in the country, according to the Centers for Disease Control and Prevention (CDC). In fact, Florida actually has more than double the number of deadly bicycle crashes compared to the next state in the rankings. And unlike other states, Florida has not managed to lower its number of fatal bicycle accidents over the past few years. If you have been injured in a car accident, don’t delay speaking to a lawyer. You have important legal rights. Protect them by speaking to a Florida auto accident attorney as soon as possible after your accident.